After Jim was diagnosed with melanoma skin cancer, the next step was to decide on a surgeon in order to get those lymph nodes biopsied right away and determine whether the cancer had spread or not. All of this happened rather quickly over the next 2 months. While life went on normally, and Jim didn’t have to cancel or reschedule anything in order to work around doctor appointments and the surgery itself, it seemed we were always coming and going to or from doctors or hospitals for pre-surgery lab work and meetings. We are fortunate to live near one of the best medical facilities in the country: Vanderbilt. And we are super-fortunate that one of the best skin cancer surgeons is on staff there. Our dermatologist told us that Dr. Mark Kelley (pictured above) is the best in Tennessee — possibly even the best in the Southeast — as far as skin cancer surgery is concerned. He trained under the guy who invented the lymph node surgery. He only does melanoma surgeries for a living. We couldn’t be in better hands. We were confident with our decision to go with Dr. Kelly. And his team has been super-helpful to us all along the way. Just do a skin incision to remove all traces of the cancer from Jim’s arm. That alone is acceptable because it hasn’t been proven that removing lymph nodes early has any impact on increasing cure rate — compared to just watching and waiting. With other diseases, removing the lymph nodes dramatically improves survival. This isn’t true with melanoma cancers. Do the skin incision and do a Sentinel Node Biopsy in order to identify the primary node leading to the tumor, remove that lymph node, and check it for any signs that the cancer has spread. In young, healthy patients it’s usually beneficial to test the lymph nodes so you’ll know what your prognosis is. Then, you can do some things that might have an impact, doctors can follow you more closely over time, and you’ll have a better idea as to whether you have a 15 or 20% chance of recurrence versus a 40 or 50% chance. Knowing whether your lymph nodes are or are not affected is useful information for most people. Also, the Sentinel Node Biopsy doesn’t add a lot of risk to the surgery that you’re already having to remove more skin from the mole site. The only things you would be adding are: (1) a biopsy incision under the armpit, and (2) an injection where they inject a “nuclear tracer dye” into several areas immediately surrounding the mole. The dye will travel to the primary lymph node that feeds the tumor site, making it easy for your surgeon to identify which lymph node(s) need to be examined for cancer. The surgery usually takes about 2 hours under local anesthesia with a little bit of IV sedation. Most people are healed up and back to normal in a couple of weeks. People usually go back to work the Monday after a Friday surgery — if their job doesn’t require heavy lifting. Next, comes figuring out how we are going to pay for all of this. The surgery alone is one thing. But after you’ve been diagnosed with melanoma skin cancer, you enter into a world of routine checkups, lab work, and follow-ups over the course of 5 years. Since we’re both self-employed, we don’t have a formal health insurance plan anymore. Instead, we are self-insured via an HSA (Health Savings Account). That means each year we set aside money to put toward Jim’s and my annual health expenses. It goes into an HSA account, and we pay for all of our medical expenses out of that account. Should we spend more than $10,400 of our own money in any given year on our combined health expenses (his and mine), then a formal health care plan (through Humana) will kick in and cover anything beyond that amount. We asked the dermatologist for a ballpark figure that we might expect to pay for the treatment of Jim’s melanoma skin cancer. Taking into account that this is Vanderbilt, he felt that $10,000 wouldn’t be out of the question for basic melanoma skin cancer surgery. When you include all of the pre-surgery evaluations and post-surgery checkups that are required, that figure climbs even higher. And if the lymph nodes end up showing signs of cancer, then it could be much more — due to the additional treatment that would be required. We sat down with the hospital’s financial consultant about a month prior to his surgery date and came up with a payment plan that works for us. On the day of the surgery, we paid $1,000 cash. It was a Friday. Jim was told to arrive at 6AM for all of the prep work, IV insertion, shaving of the mole site and armpit, etc. The dye would be injected at 9AM to identify the lymph node(s) in question. His surgery would start at 11AM and last approximately 3 hours, followed by another 2 hours in recovery. When Jim was wheeled into the surgery room, I went to the waiting room to sit with the families of dozens of other cancer patients who were undergoing surgery on this same day. After the 3 hours had passed, and turned into 4 hours, and almost 5 hours, my eyes became glued to the patient board. Jim’s status wasn’t updated much, compared to the other patients’. First, while the one (primary) lymph node was found easily. It was much bigger than they thought it would be. In addition to its large size, it was also unusually sticky, so it took 45 minutes to remove it, instead of the usual 20 minutes. 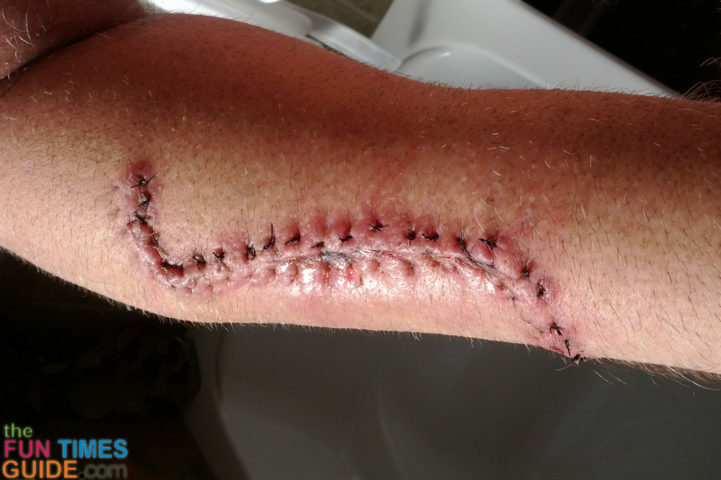 However, the regular straight line excision wasn’t holding together with normal sutures, so Dr. Mark Kelly was faced with the dilemma of trying a complex flap closure or doing a skin graft. He really didn’t want to go the skin graft route, since he hadn’t spoken with Jim about it previously, and it would mean yet another place on his body that would have to heal, in addition to everything else that goes along with skin grafts. So he made the incision into a very large S-shape instead. That way, he could pull skin from the lower curve of the S to meet up with skin pulled from the upper curve of the S at the original straight line incision site. The wound site became a lot longer and more complicated than they initially anticipated it would be — which is why Jim’s surgery took so long. Also, the skin on Jim’s arm is now very tight — almost too tight, according to the surgeon. Still, it’s better than a skin graft (also according to the surgeon). However, going back to work on Monday isn’t as likely as it was before. And since they had to switch to nylon sutures in order to get things to hold, Jim will have to return in 2 weeks to have them removed. Now we wait. We will get the results of the Sentinel Node Biopsy in 1 to 2 weeks. At that point, we’ll know once and for all if the cancer has spread or not. Oh, and for what its worth, if you’re about to undergo surgery like this… No matter how good you might feel after getting your bearings, drinking water, and peeing prior to being released from the Recovery room, the nausea will catch up with you the moment you step foot in the car to go home. For Jim, it was after we drove one block. For me, when I had my surgery for endometriosis, I think I made it 2 blocks. There’s just something about the motion from being in the car after you’ve had anesthesia. So be ready for it! Aside from the fact that Jim’s arm was very tight — which made it hard to move and uncomfortable in the first days after surgery — the Percocet (oxycodone 5 mg + acetaminophen 325 mg) helped a great deal with the pain. He only took it for a few days (once every 4 hours), instead of the full week that he was prescribed. His hand, fingers, and wrist appeared very swelled for several days following surgery. The spot where the lymph node was removed didn’t give him a bit of trouble (or pain) until 5 days after surgery. Suddenly, he had a spot in his armpit that was as hard as a rock. This made it uncomfortable for Jim to hold his arm at his side without pain. The surgeon said to keep an eye on it, and to come in right away if it became hot to the touch, or more sore. The pain and swelling under his armpit stayed constant for the next week. To help ease the pain, Jim put a water bottle in the freezer, then put that under his armpit for an hour or so at a time. Keeping his arm raised (stretched out, completely above his head) also helped to ease the armpit pain. 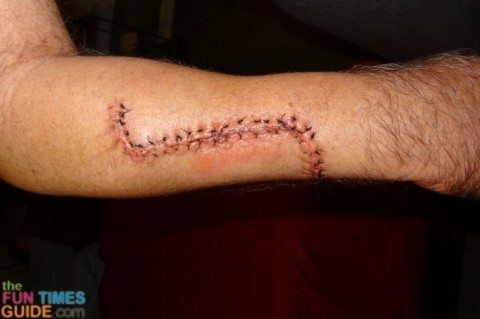 According to Jim, the most difficult part post-op was wrapping the incision site where his arm stitches were. If you got the Ace bandage wrapped around the arm tight enough, it would stay in place, but cut off circulation. If you got the Ace bandage wrapped around the arm loose enough, it would start to bunch up and eventually fall off. We ended up switching to thin sterile pads and tender tape after the first week. They’re much easier to change and keep clean. And the tender tape keeps the pad in place without tugging on your arm hair. Keep the arm raised above your head as much as possible. This helps to significantly reduce the amount of swelling under the armpit. The nurse said if you don’t raise your arm, then you’re not giving the fluid anywhere to go. When the fluid builds up there, it creates a knot — which could lead to infection. Apply an antibiotic ointment on top of the sutures every time you change the dressing — like after a shower. On the days that Jim didn’t do this, the skin began to turn dry and itchy all around the sutures. 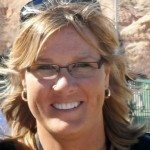 Stay off the computer as much as possible in that first week following surgery. The pressure that’s created when your wrist rests on the keyboard leads to even more swelling and achiness. Refrain from repetitive motions for the first 2 weeks — like constant use of the computer mouse, holding the phone up to your ear for too long, or overusing that arm in any way. Tingling/numbness underneath the upper arm (on the back) – Nerves are almost always affected to some degree after lymph node surgery. (the more nodes removed, the worse the tingling and/or numbness will be and the longer it will prevail. In most cases, it will get a little better over time. However, in come cases, it could last forever (especially if you had many lymph nodes removed). Jim only had 1 lymph node removed, but the tingling still remains for now. This is the biggest downside to the whole experience, in Jim’s opinion. Numbness immediately surrounding the incision where the mole/tumor was removed – Nerves can become nicked or cut, depending on how wide and deep the surgeon must cut in order to remove enough tissue from the site of the tumor/mole. Sometimes feeling will be regained. Jim is still waiting. Jim’s first follow-up appointment was 4 days post-op. The surgeon, Dr. Mark Kelly, wanted to see how well his stitches were holding together. (Remember, Jim’s case was unusual. Since his skin wasn’t holding together after the typical straight-line incision & sutures, the surgeon had to make a huge S-shaped incision and use thicker sutures.) Also, Jim wanted to travel 8 hours by car that next morning in order to work at an NHRA race in Gainesville, Florida. 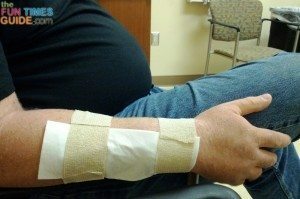 Dr. Kelly said that it wouldn’t be a problem, as long as he took antibiotics (Cephalexin 500 mg, twice a day), kept applying antibiotic ointment to the sutures, and kept an Ace bandage over the sutures at all times. At this point, the swelling was still intense — both in Jim’s arm/wrist and under his armpit. The doctor said that everything looked normal, but to keep an eye on the huge knot under his armpit. It was simply body fluid that was looking for a place to go. The recommendation: for Jim to keep his arm elevated (high, above his head) as much as possible. Unfortunately, Jim initially thought that “elevated” meant keyboard level — so he could still work on the computer all day. WRONG! 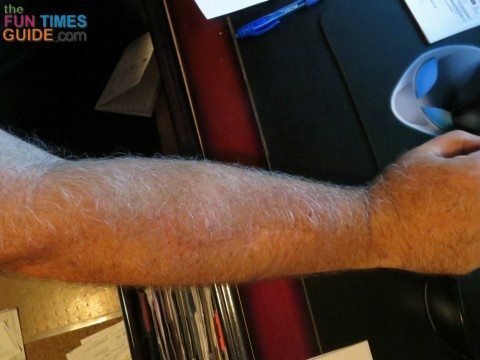 He learned the hard way (a week later) that all the time he spent on the computer actually delayed the swelling from going down in his arm/wrist and armpit. At this point, the swelling was much less but still evident — especially under Jim’s armpit. The doctor said to watch for it to turn red and/or become hot — because that fluid build-up could definitely become a source of infection. If it gets any worse, he might need to have it drained. The suture removal was a little tricky since Jim’s arm skin is still so tight and a little swollen. 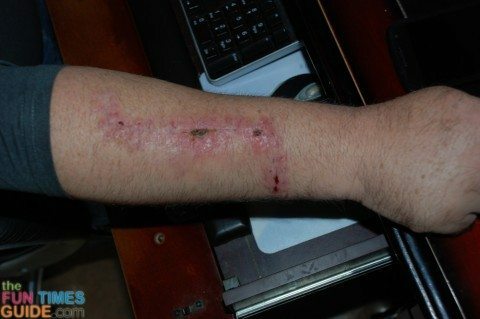 He was warned that the incision could still split open, if he uses his arm too much (like being on the computer for too long) and if he doesn’t keep his arm raised over his head (to give the fluid somewhere else to go and eliminate the swelling). Jim’s fourth follow-up appointment is scheduled for 6 months post-op. At that time, the surgeon (or his nurse practioner, Shirlene Chase) will determine how well the large S-shaped incision has healed and address any scarring issues. Ditto for the lymph node incision site. I believe this will be Jim’s final meeting with his surgeon. Fortunately, we learned one week after the surgery that Jim’s lymph nodes were FREE of cancer! From this point forward, watching and waiting is the #1 best course of treatment for him. An immune-boosting treatment (immunotherapy) is also an option, if he would like it. But it would only decrease the likelihood of melanoma cancer recurring in Jim’s body by 1% (from 20% to 19%), based on his stage: IIA. In the event that cancer would have been found in Jim’s lymph nodes, then all of those lymph nodes would have been removed, and an immune-boosting treatment (immunotherapy) would have been considered, even though it’s only effective in 2 to 5% of the cases. For the first month (4 weeks), you must go to the hospital every Monday through Friday (5 days a week) to receive an injection of the Interferon. For the most part, you feel as though you’ve been infected with a virus, like a flu, for the entire year. 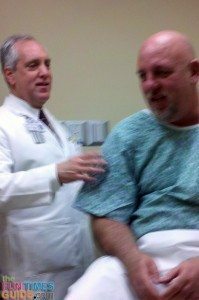 For low-and moderate-risk patients (like Jim who is Stage IIA), Interferon injections are left up to the discretion of the patient — since they are only minimally helpful, and the risk of cancer reoccurring is so low to begin with. For higher-risk Stage III and above patients, Interferon is more often recommended — because it reduces the recurrence risk and lengthens the time until the cancer comes back. However, its impact on cure rate (your likelihood of being here in 5 years) is mixed. Some studies show a 3% to 5% benefit. But other studies show the cure rate is the same with or without the Interferon. Younger, healthier patients and those with young families tend to get the Interferon treatments, whereas older patients don’t. There are also a few experimental drugs for melanoma patients that are currently being studied which could be another option for higher risk patients. With other cancers, such as breast cancer, there are drugs that work throughout the body to eradicate the disease and improve chances of being cured after the lymph node surgery. That’s not yet the case with melanoma. QUESTION: Does melanoma start as one of the other “safer” cancers (basal cell carcinoma and squamous cell carcinoma) and fester into a melanoma? Or does melanoma cancer start as a melanoma and remain a melanoma? ANSWER: Melanoma cancer starts as a melanoma from the get-go. Other types of skin cancer don’t turn into melanomas. QUESTION: If Jim had gotten the mole checked earlier, would it have been shallower and less severe? ANSWER: Yes, most likely. However, melanomas grow at different rates, so it’s difficult to say at what point someone’s tumor would have been detectable and less than 1mm in depth — which is when you want to catch a melanoma so that the risk of it spreading to the lymph nodes is virtually nil. QUESTION: What determines how deep a melanoma skin cancer is? Length of time is my first guess — it starts shallow, then grows deeper over time. Is this true? 1) For most people, it doesn’t gain access to the bloodstream or the lymph nodes. It just sits there. And if you take it out, you’re fine. 2) But, if it gains access to the bloodstream or the lymph nodes, it then starts traveling to other parts of the body and it becomes more difficult to treat and contain. ANSWER: When a cancer is intradermal it’s usually a sign that the cancer started somewhere else and spread to this this site. Thus, the importance of having those lymph nodes checked. 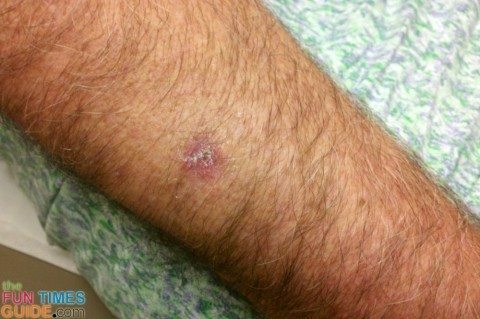 Usually, when there’s a melanoma that is in the deeper tissues of the skin, yet it’s hardly visible on the surface of the skin (Jim’s mole wasn’t very raised and it had turned kind of clear – no real color at all), then it usually means that the cancer started somewhere else in the body first — instead of presenting itself as a mole first like most melanoma skin cancers do. Prior melanoma history is usually what causes that to happen. 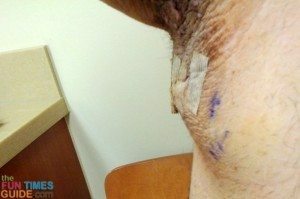 In Jim’s case, since there was no prior history of melanoma cancer, the surgeon was fairly confident that his cancer had started at that site on his arm, so being intradermal wasn’t all that concerning. QUESTION: We keep hearing about chest x-rays and Pet Scans. Why are those things so popular and/or important. ANSWER: They’re popular, but not important. Melanoma cancers are much more likely to be found visually during full-body checkups than on scans or x-rays. By the time a melanoma cancer is visible in such a scan it’s too late — the cancer has already spread. Thus the importance of those constant full-body checkups! The only time that a chest x-ray is beneficial is if there’s no visible sign of melanoma, but you’re experiencing a cough, losing weight, or your bloodwork shows elevated liver numbers. QUESTION: What are the true risks of still being in the sun even after this diagnosis? Is he more likely to keep getting more episodes of skin cancer? Would it make the healing of Jim’s current cancer even worse? Would it make any tiny trace of cancer that might have been left in his body to quickly spring up? Would new cancers be more likely to appear — and deeper than normal? ANSWER: Yes to all of the above. You pull together and join forces on everything now. You see things from a different perspective now. You appreciate things more than ever now. You realize just how lucky you’ve been to have what you have and to have done what you’ve done in life already. Although skin cancer — even melanoma skin cancer — isn’t a death sentence, the diagnosis still causes you to pause and think about your future together and your own mortality. Download a voice recorder app on your cell phone, and use that to record every single conversation you have with doctors, nurses, etc. For example, on my Samsung Galaxy Nexus, I use the Voice Recorder app. There are several other voice records for Android phones, as well as many voice recorders for the iPhone. The audio files have been a lifesaver for us! We have referred to them several times in order to refresh our memory about a procedure, or to refer to something that has new meaning now since we’ve actually lived through it. It’s also helpful so you’ll know word-for-word (and step-by-step) exactly what you’re supposed to do the night before surgery, the first day at home after surgery, etc. There are times when your emotions may be all over the place (like in the moments immediately following surgery) or the doctor may be talking so fast that you can only remember bits & pieces (in all of those pre- and post-surgery doctors appointments). So to be able to replay those words and instructions again brings a lot of peace of mind. For what it’s worth, I just click record whenever they enter the room and then set the phone down on the chair next to me (or I hold it in my hand). That way, the idea that I’m recording won’t make anyone feel uncomfortable or “in the way”. Other than the surgery described above, Jim didn’t do any other form of treatment after they removed the melanoma tumor from his arm. He had bloodwork drawn and visits with the oncologist every 6 weeks, but that was it. He declined the opportunity to receive Interferon as a melanoma cancer treatment — because (as described above) the treatments were invasive & frequent, the side effects were pretty bad, and the success rate was pretty low. At the time, Interferon was the only treatment currently approved by the FDA as adjuvant therapy for melanoma patients (to lower the risk that the cancer would come back). One year to the day after his melanoma surgery, the cancer came back in the form of 2 new tumors in the same arm. They also found 7 small tumors in his right leg, as well. The plan was to aggressively treat the tumors in his arm with regular injections, while also receiving periodic infusions that would attack any cancer cells throughout his body. According to the rules of the clinical trial, in order for a tumor to be injected, it had to be close enough to the surface of the skin to see and measure over time. The tumors in his leg were not — they were deep and relatively small. So we relied on the infusion treatment to do its job — over time. The short story: both forms of cancer treatment worked miraculously for Jim! Due to the continued shrinkage of the leg tumors (which were never injected during the clinical trial), we have to believe Treatment #2 described below was the most effective… and long lasting. #1 Treatment – Jim participated in a clinical trial at Vanderbilt — the Oncovex Pivotal Trial for Melanoma. This is where he received one type of immunotherapy treatment in the form of an injection called T-VEC. The injection is a genetically-modified form of the herpes virus that only attaches itself to cancer cells in the body. That injection alone magically shrunk the tumors in Jim’s arm. After 6 injections (instead of the required 8 for all study participants), Jim’s arm tumor vanished completely and never came back. #2 Treatment – Jim had cancer immunotherapy treatment in the form of an infusion. Ipilimumab or Yervoy (also called Ippy) by Bristol-Myers Squibb was the best cancer drug available before the recently approved Keytruda hit the market (see below). Ipilimumab (Yervoy) is a form of cancer immunotherapy approved by the FDA for the treatment of metastatic melanoma. Ipilimumab is a monoclonal antibody that targets CTLA-4, a protein that helps to regulate the immune system by suppressing the activity of T cells. By blocking the action of CTLA-4, Ipilimumab acts to take the brakes off the immune system, allowing it to fight the cancer cells. This agent is used to treat melanoma that has spread or that cannot be treated by surgery. However Ipilimumab can lead to serious immune-related side effects in the intestines, liver, hormone-producing glands, eyes, nerves, skin and other organs. One of the newest forms of cancer immunotherapy that’s getting a lot of press right now is Pembrolizumab or Keytruda (also called Pembro) by Merck. It’s the newest cancer drug specifically approved for melanoma. Jim’s cancer doctor speaks very highly of it as well. Even though the cancer returned in Jim’s arm and leg, it hasn’t stopped him one bit. He has never felt sick from any of the treatments. He has continued to do all of the same things he did before he got the initial diagnosis of melanoma skin cancer — including riding his motorcycle cross country several times, even to Alaska! A year and a half after his melanoma surgery (when the injections and infusions ended), he went back to routine 6-week checkups with the oncologist (including bloodwork), as well as quarterly MRI scans. Now, here it is 3 years after the initial diagnosis and he’s doing GREAT! A couple of the tumors are still in his leg, but their size is negligible and his cancer doctor isn’t concerned. Life is good.